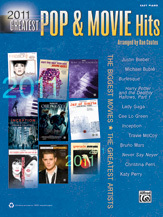 From pop gems to dance floor anthems, these are the tunes to play in 2011! Lyrics and chord symbols are included in each arrangement. Titles: Billionaire (Travie McCoy featuring Bruno Mars) * Born This Way (Lady Gaga) * Born to Be Somebody (Justin Bieber, from Never Say Never) * Dream Is Collapsing (from Inception) * Firework (Katy Perry) * Forget You (Cee Lo Green) * Grenade (Bruno Mars) * Haven’t Met You Yet (Michael Bublé) * Jar of Hearts (Christina Perri) * Just the Way You Are (Bruno Mars) * Not Like the Movies (Katy Perry) * Obliviate (from Harry Potter and the Deathly Hallows, Part 1) You Haven’t Seen the Last of Me (Cher, from Burlesque).